MONTVALE, NJ -- (MARKET WIRE) -- August 2, 2006 -- SYS-CON Media (www.sys-con.com) announced today the print edition of AJAXWorld Magazine, the leading online AJAX news and content Website (www.ajax.sys-con.com), will debut at the upcoming AJAXWorld Conference & Expo, October 2-4, 2006, in Santa Clara, California. 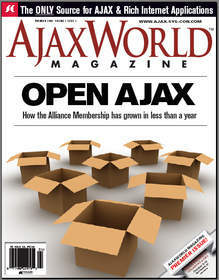 AJAXWorld Magazine and AJAWorld Conference & Expo will be sponsored by leading technology vendors. Information on advertising, sponsorship and exhibit opportunities can be obtained by e-mail at events(at)sys-con.com or by phone at 201 802-3020. Charter sponsors of the conference and AJAXWorld Magazine advertisers include: Adobe, TIBCO, Apress, Backbase, ComponentArt, Helmi Technologies, Laszlo, Nexaweb, telerik, Google, Parasoft, and ILOG. SYS-CON's well-known and highly respected magazines' Web portals include: AJAXWorld Magazine (www.ajax.sys-con.com); Java Developer's Journal (www.JavaDevelopersJournal.com); .NET Developer's Journal (www.DotNETDevelopersJournal.com); Enterprise Open Source Magazine (www.opensource.sys-con.com); Linux.SYS-CON.com (www.linux.sys-con.com); SOA Web Services Journal (www.WSJ2.com); Wireless Business & Technology (www.WBT2.com); XML-Journal (www.XML-Journal.com); WebLogic Developer's Journal (www.WeblogicDevelopersJournal.com); WebSphere Journal (www.WebSphereJournal.com); Web Developer's & Designer's Journal (www.webddj.sys-con.com); ColdFusion Developer's Journal (www.ColdFusionJournal.com); PowerBuilder Developer's Journal (www.PowerBuilderJournal.com); IT Solutions Guide (www.itsolutions.sys-con.com); Information Storage & Security Journal (www.issjournal.com); Eclipse Developer's Journal (www.eclipsedevelopersjournal.com); Symbian Developer's Journal (www.symbian.sys-con.com); Web Hosting Journal (www.webhosting.sys-con.com); and Web 2.0 Journal (www.web2.sys-con.com). SYS-CON Events, Inc. (www.events.sys-con.com) is the world's leading producer of i-technology conferences, seminars and expos, including SOA Enterprise Open Source Conference (www.soaeosconference.sys-con.com), "Real-World AJAX" Seminar Series (www.ajaxseminar.com), "Real-World Flex" Seminar Series (www.flexseminar.com), iTVcon - Internet TV Conference & Expo 2006 (www.itvcon.com), International AJAXWorld Conference & Expo (www.ajaxworldexpo.com), and Real-World Ruby-on-Rails Seminar Series (www.rubyonrailsseminar.com).